Virginia Tech President Tim Sands and the Hokies on the Hill class of 2017 in front of the Capitol in Washington, D.C. 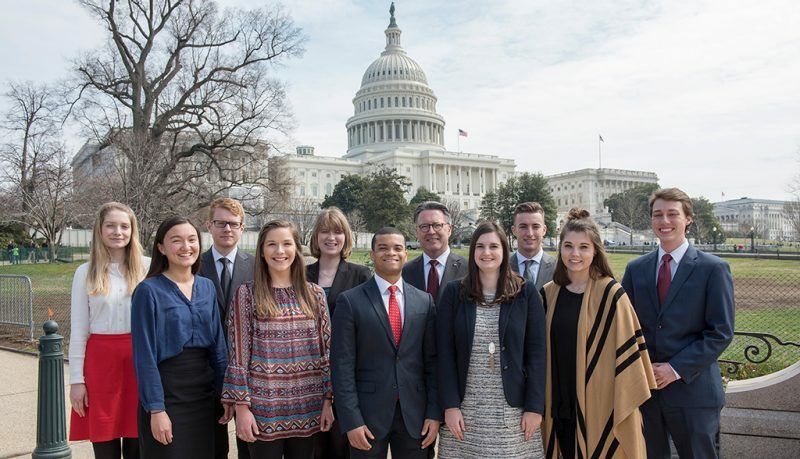 The Office of Government Relations offers opportunities for both undergraduate and graduate students to learn first-hand about politics, and to gain real-world experience in both the nation's and state's capital. The Hokies on the Hill program is open to all sophomore, junior, and senior Virginia Tech students. Earn credit for a full-time course load while working, living, and learning in Washington, D.C. The General Assembly Fellowship is open to graduate students interested in state government and higher education policy. Click on the tabs to the right to learn more about these unique opportunities.